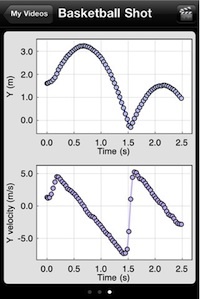 Vernier Video Physics uses video data to calculate velocity over time. Vernier Software & Technology has rolled out a new application that works with the iPod touch, iPad, or iPhone to collect physics data. An Oregon-based company founded in 1981, Vernier Software & Technology started out selling data collection software with manuals that provided directions for building sensors. Today, the company offers software, sensors, lab books, interfaces, and lab equipment. The company's new application, Vernier Video Physics, uses the video recorder of an iPhone, iPad, or iPod touch to capture an object in motion, such as a baseball thrown through the air, and mark that object's position frame by frame. After receiving the distance the object has traveled, the application creates graphs for position, trajectory, and velocity. Features include the ability adjust the video's scale around the known size of an object and the ability to export video with appended graphs to a photo library. Data, video, and graphs marked or created by the application are compatible with Vernier's Logger Pro software, the data-collection program that Vernier Video Physics is based on. Vernier Video Physics runs on iOS 4 devices and can be downloaded for free from the iTunes App Store.